A low, spreading herbaceous perennial with hairy stems that take root where they touch the ground. Flowers in rounded or flat-topped, terminal clusters, tubular, with 5 lobes. Makes spectacular displays on dry, rocky hillsides. Color varies from true pink to magenta to rose-purple, probably depending on soil. Blooms March-November. Leaves variable, opposite, on petioles, more or less 3-divided with toothed lobes, to 3 inches long. Height: usually to about 1 foot. Occurs on prairies, fields, pastures, dry hillsides, waste places, glades, borders of woods, and rights-of-way. Often cultivated, it does best in fairly sunny locations and tolerates dry to medium-moist conditions. 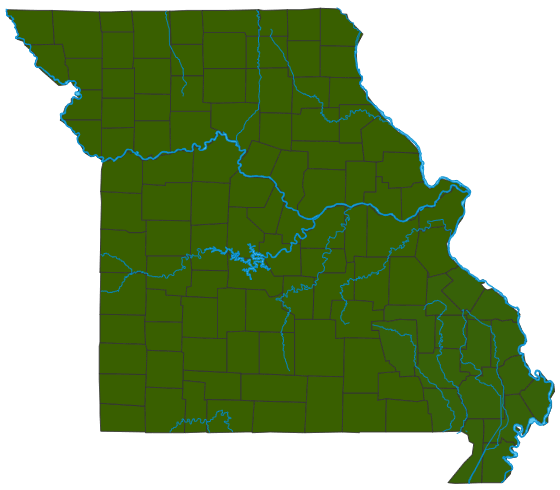 Statewide, but especially in central and southern Missouri. Long considered a member of the genus Verbena, this species is currently placed into the genus Glandularia based on a number of factors, including chromosome data that were unavailable to botanists in previous decades. Because it was so long known as "Verbena canadensis," it still appears under that name in many guidebooks and manuals. This native plant is great for rock gardens, edging, and in containers, where it forms masses and spreads as a ground cover. Special cultivars, with variations of flower color and plant compactness, are available at garden stores. A number of bees, butterflies, and skippers drink nectar from the flowers, and the seeds may be consumed by mice and birds. Seeds that are carried away but not eaten might be dispersed this way. The plant, however, can still spread vegetatively by rooting where the stems touch the ground.